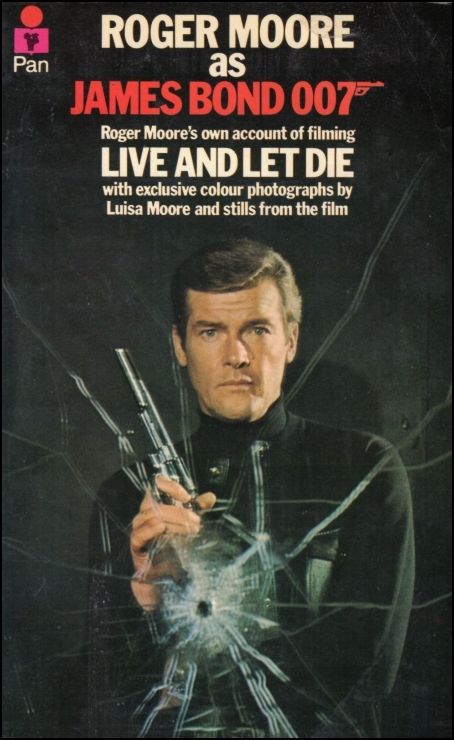 Roger Moore PANs, a couple of covers and a new mag. With the sad news of Roger Moore’s death last week I started sorting out all the PAN titles he appeared on and after a very enthusiastic start was quite disappointed to only find seven! 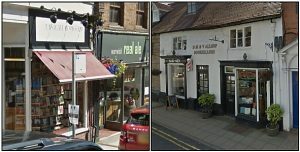 Click HERE to see them but if you can think of any more please let me know. I was sure there would be some ‘The Saint’ titles but haven’t found any with the Moore TV tie-in. UPDATE Just found he’s on the cover of ‘Gold’ from 1974 so now there are eight. I also heard from a friend who has numerous pieces of original PAN book cover artwork and is currently trying to get copies of the books to go with the artwork. There are not many to go and I thought it would be easy especially for ‘The Slave Stealer’ as it is often advertised. It was only while trying to find the 1974 version that I realised how many were actually the 1971 edition. Quite a ‘raunchy’ cover for a PAN. 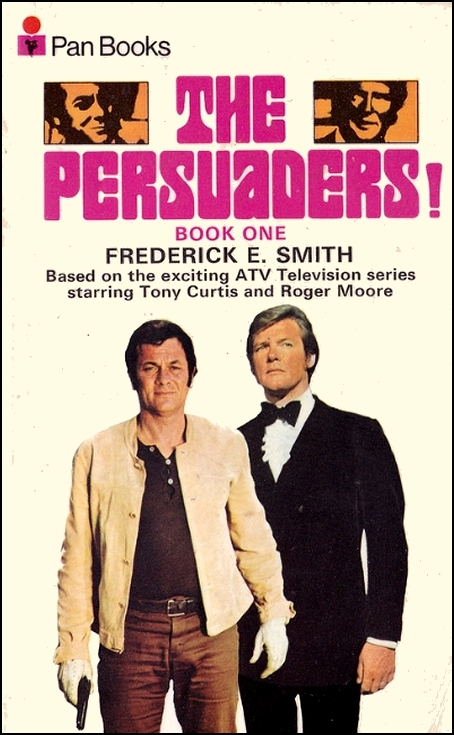 I might have to read it to see if it mentions what colour the voyeurs shirt actually was. Lastly I noticed there was a new magazine out called ‘Infinity‘ which includes an article on pulp science fiction by Neil Pettigrew, a name very much associated with the ‘Pulp and Paperback Fair’ in London, the next being October 29th. 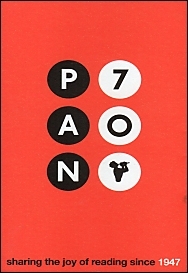 I was pleased to see six PAN covers amongst the examples. 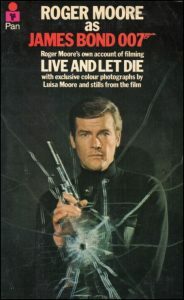 Very sorry to hear of the death of Roger Moore today, sadly overshadowed by the tragic events in Manchester here in the UK. He was born in London 14th October 1927 and died Switzerland 23rd May 2017. I think he will always be remembered for playing James Bond in spite of all his other accomplishments. I had no takers for last weeks question as to who it was holding their original artwork for a PAN title. Well the answer was Eric Tenney probably most well known for his animal studies. I couldn’t find an email address for him so actually wrote a letter and was pleasantly surprised to get a call from him saying he still had the artwork for ‘Shockwave’ by Colin Forbes and that he had also painted at least three more Forbes covers plus other assorted titles which I’ve scanned and added HERE Eric’s daughter Susan kindly sent me photos of what I think are printers proofs Eric has filed away and it is from these I selected the PAN titles but I do also like the Fontana Ngaio Marsh covers. I have noticed the ‘Shockwave’ cover in the photo is actually the Guild Publishing edition and the same artwork was used for this as well as the PAN hardback and paperback editions. 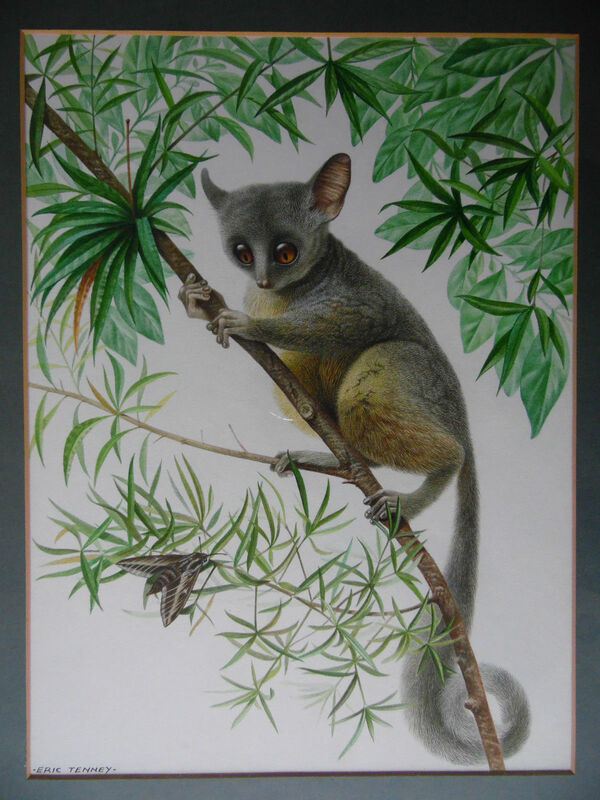 I’ve also included, for completeness, a cover by another wildlife artist, Peter Warner who sadly died in 2007. It seems strange that someone who specialise in cats did the cover for dog stories! …. and finally after mentioning GEEK Comic Com last week I managed to speak to Colin Baker. Well I felt sorry for him as nobody else was but I think he’s getting old as I said I remembered when we last met in 1985 but he didn’t! 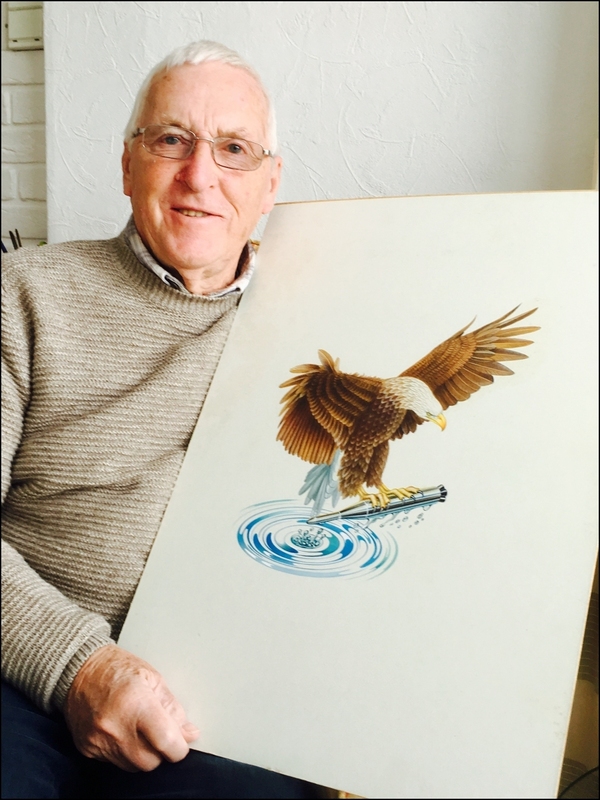 STOP PRESS Just got a lovely piece of original Eric Tenney artwork off eBay. It had the ‘Make me an offer option’ so I went for a silly price I thought would be rejected but was accepted, why didn’t I go lower! I used my usual ploy and told my wife I’ve bought it for her, now just waiting for it to arrive. Question of the Week plus latest additions. The question of the week is does anyone recognise this art work for a PAN book cover being held by the well known artist who painted it? I’ve bought a few more PAN books with covers by the same artist and if they’ve arrived by next week I’ll name names otherwise it will be the week after. The prize is just the pride/smugness you’ll feel for getting it right! I’ve also found ‘The Pan Book of Crosswords Book 7’ form the 60/70’s and now only number one of this series to be found. If only all sellers actually showed a picture of the book they were listing, I’ve given up sending back the ones I don’t want but the local charity shop does well out of it. I’ve also added ‘The Sunday Times Calendar Cookbook’ which I could only find at silly prices but may have been using the wrong ISBN as it now appears to be available at a price I was happy to pay. 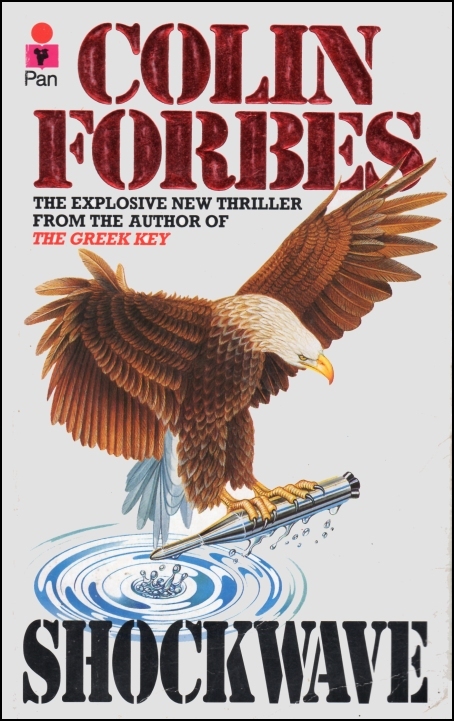 I’ve also found yet another cover variant for a Jack Higgins namely ‘Storm Warning’ from 1977. It’s odd with prices as I was contacted by a fellow collector after a title he could only find on AbeBooks at over £100 pounds, I looked on Amazon and there were two copies for a couple of pounds. Like my ‘Times’ book I think we can all missearch every now and again. … and lastly I spent Saturday at the GEEKS Comic-Con 2017 followed by the G Rail Show on Sunday all on our doorstep, why aren’t there any paperback book fairs? A moan about bookshops plus these aren’t PAN paperbacks! 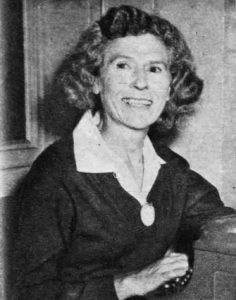 A wrappered edition is just a bookseller’s term for a paperback…, and that’s the only format that Pan ever published their books in. Abbreviated as “wraps”, wrappers are the paper covers of a pamphlet, often of a paper of heavier weight than the text paper; when you see “wrappers” you know the item is not a hard bound book, but is instead a pamphlet or magazine with paper covers; usually not used to refer to 20th century paperback books which are called “soft bound” (with paper covers). It does not have a painting on the front, it is not a first and is not particularly rare but I agree it is an Australian edition. They have two copies with one at £198 and the other at £376! The seller also states that PAN only published paperbacks which as any fan knows is just not true. They published hardbacks and even some with plastic covers. Here are a couple of links to show examples, ‘Chances’ by Jackie Collins (which I just happened to have to hand) in hardback and softback and three titles ‘wrappered’ in PVC. And talking of booksellers, why can’t they stick to their opening hours? While in Warwick last week I had done my research on my favourite site HERE and found two bookshops in the same street, one open until 5:00 the other 5:30. As it was 3:30 I though we had plenty of time so called in to the first one we passed. Leaving there about 4:00 we went to the next to find the one supposedly open until 5:00 had closed at 4:00 according to the bit of card on the door. No explanation as to why. Interesting Art Installation plus a couple of covers. Just back from a few days away in the camper in the middle of Warwick Racecourse. Unfortunately no racing while we were there as we’d have had a great view. While there I got an interesting email from artist Conor Masterson who had been given my details by PAN Books. It was in relation to the Virtú Exhibition at the Hunt Museum, Limmerick, Eire which includes one of his art installations. Virtú, Friday 7th April – Sunday 21st May. Virtú is a curated exhibition that explores the ongoing relationship between The Hunt Museum and LSAD. 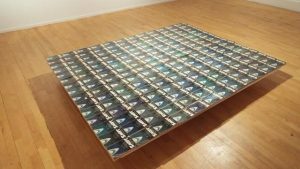 The exhibition includes contemporary artists working in various disciplines and a collection of drawings from several collections including IMMA and The Hunt Museum. Join us on Friday 7th April, 3pm for an interactive discussion with the artists of Virtú, as they discuss their works and artistic processes. While in Warwick I picked up a couple books which were not PAN but slightly related. 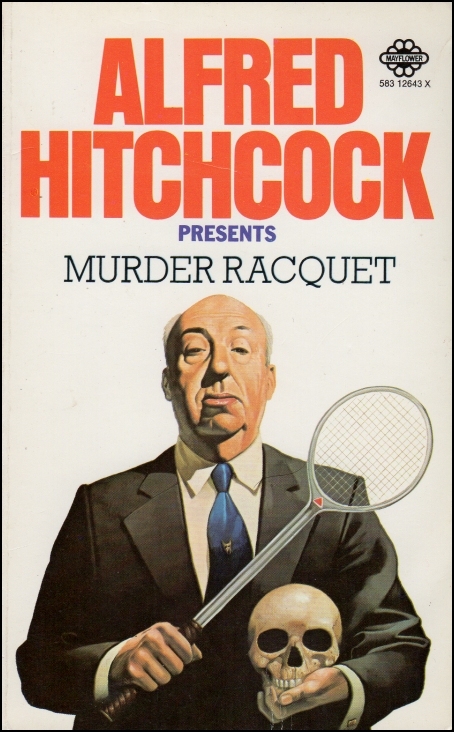 “Murder Racquet” by Hitchcock with a cover by Les Edwards who did the cover for “The Scrapbook of PAN Horror Stories” by Johnny Mains currently on hold. 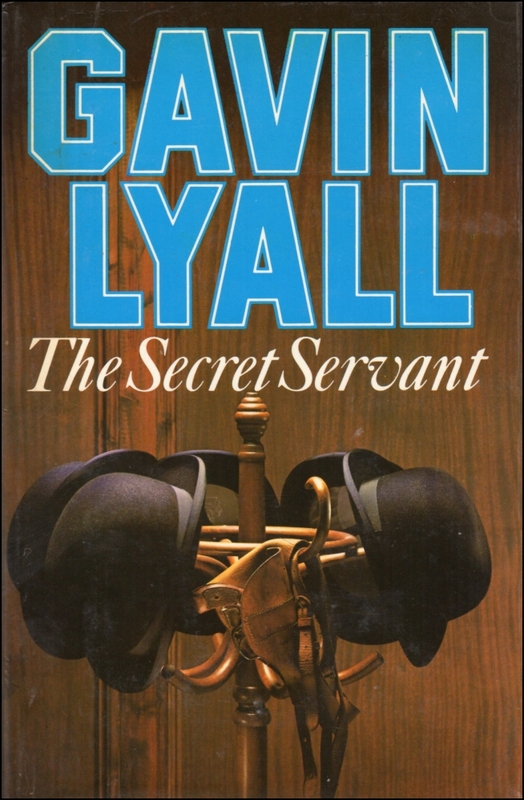 The other was “The Secret Servant” by Gavin Lyall, a PAN Books stalwart, with a cover I’ve not seen before from Raymond Hawkey, a name familiar to all PAN/Bond fans. 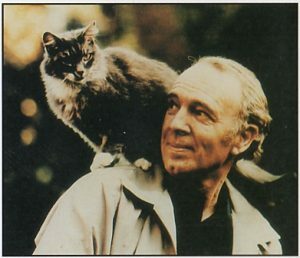 I liked the photo of Gavin in this book as it shows him with a cat. Currently having 5 cats with us I’m trying to remember when we only had one!